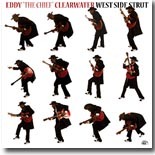 Eddy “The Chief” Clearwater’s Alligator debut was one of the most anticipated blues CDs of 2008. Known around the globe as a consummate showman, Clearwater – a long-time giant of the West Side Chicago blues sound – is ecstatic about the record deal. “Recording for Alligator is a dream I’ve had for many years,” says The Chief. Clearwater becomes the first Chicago-based artist to release a recording on Alligator since the early to mid ’90s. Ronnie Baker Brooks was hand-picked by Clearwater to produce West Side Strut. This has resulted in different, newer, and younger ideas being added to Clearwater’s established sound. Baker Brooks also contributes guitar, percussion, bass, background vocals, two original songs as well as three co-written songs. Best of all the differing styles (traditional versus contemporary) of these bluesmen complement each other instead of colliding with each other. The CD contains blues, soul, and gospel. The sonic innovation of Billy Branch’s harp, in the opening number, "A Good Leavin’ Alone," makes it known that this is a loud, proud, and bold Chicago blues record. Here, while blazing a trail on his fret board, Clearwater growls the lyrics out like a bear. Throughout the duration of the disc, his vocals are far more tame and weary. "Gotta Move On" is a soulful ballad that is emotional and sensitive, whereas "Too Old To Get Marrie" is the exact opposite. The latter is a fun rock and blues boogie that features Lonnie Brooks on guitar and vocals. Clearwater’s Indian heritage is heard in the heavy beat of the ultra contemporary "They Call Me The Chief." Eddy, who has been in Chicago since 1950, doesn’t need to lean on the strength of cover songs because his own songs are strong enough. Yet, Clearwater and Branch have a blast – literally – trading solos on Muddy Waters’ "Walking Through The Park" which is made to sound very contemporary. "Rock-A-Blues Baby" was almost left off the album. It combines pop and hip-hop beats with heavy metal power chording and sounds unlike anything else on the disc. The best songs were written by all the contributing songwriters. Ronnie’s hot rockin’ guitar rips on the captivating "Hypnotized." The gospel sounding "Do Unto Others" – about treating others with respect – was written by Clearwater’s publicist Karen Leipziger. Guest vocalists Jimmy Johnson and Otis Clay make the track superb, while Baker Brooks’ remarkable guitar work brings forth the emotions of the stirring lyrics. Clearwater’s best guitar performance surfaces on a brilliant cover of Lowell Fulson’s "Trouble Trouble." With a rich and deep message for hate and war to cease, the gospel-like "A Time For Peace" is enriching due to the backing vocals of six accompanists. Here and throughout, the organ and piano of Darryl Coutts is dazzling. It could be a challenge to re-create these songs live as they were not recorded with Clearwater’s band – they were recorded with Baker Brooks’ band. Yet, this is an exceptional album. West Side Strut is the perfect mix of young and old, traditional and contemporary, today and tomorrow. It is a strong contender for blues record of the year.